In his first communication to Delhi Chief Minister Arvind Kejriwal since the latter began a sit-in at his office, Lieutenant Governor Anil Baijal on Tuesday wrote to the CM asking him to meet officers urgently to address concerns of both sides through dialogue. Later, Kejriwal called off his nine-day sit-in after bureaucrats started attending meetings with Aam Aadmi Party ministers, said Sisodia. "If the L-G has prompted the strike by the IAS officers, it is very unfortunate. It is a small victory. 99 per cent of the IAS officers are very good. We have done a lot in power and water sectors and we could not have done this alone," he told the party workers. Sisodia, in a hurriedly-called press briefing, said that the sit-in was 'not a dharna' as they were 'waiting to meet the LG'. 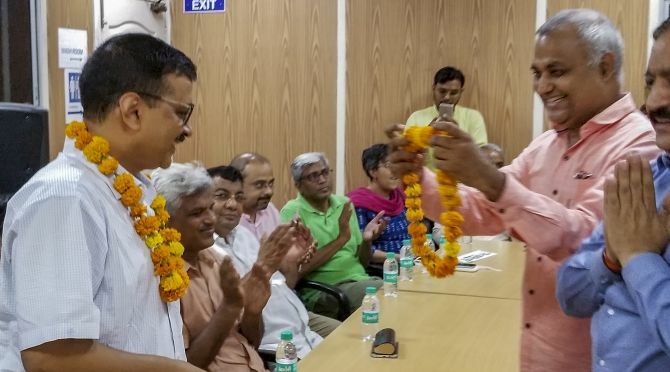 Kejriwal, Sisodia, Health Minister Satyendar Jain and Labour Minister Gopal Rai had started a sit-in protest at the L-G's office on June 11 over their demands, including a direction to IAS officers to end their 'strike'. Sisodia and Jain, who were on a hunger strike at the L-G's office and were hospitalised after their health deteriorated, were discharged this morning from the LNJP Hospital. 'The L-G requested the CM to urgently meet the officers at the Secretariat so that apprehensions and concerns of both sides can be suitably addressed through dialogue in the best interest of the people of Delhi,’ an official from Baijal's office said in a statement. The official said Baijal had earlier advised the AAP government to make efforts to restore trust between the elected government and the officers. 'The L-G stated that he was glad that the CM had tweeted an appeal to the officers assuring them of safety and security in their interactions with the elected government. 'The L-G observed that he has been informed that the officers have also welcomed the appeal and they are awaiting the CM's presence at the Secretariat to hold discussions,’ the statement added. The bureaucrats have been at loggerheads with the AAP dispensation following the alleged assault on Chief Secretary Anshu Prakash in February. Meanwhile, the Bharatiya Janata Party leaders, who had been on a hunger strike at the Delhi secretariat, also ended their protest after Kejriwal and his ministerial colleagues called off their sit-in. Leader of Opposition in Delhi Assembly Vijender Gupta, BJP MLAs Manjinder Sirsa and Jagdish Pradhan, West Delhi MP Parvesh Verma, and rebel AAP MLA Kapil Mishra sat on the dharna on June 13 demanding that Kejriwal and his ministers resume work and address the water crisis faced by Delhi people. Barring Pradhan, all of them started hunger strike from June 15. Gupta had to be hospitalised earlier in the day due to falling health. Sirsa, Verma and Mishra broke their fast in the presence of Union minister Harsh Vardhan who visited them at the Delhi secretariat. Gupta claimed victory, saying the chief minister and his cabinet colleagues were forced to end their ‘meaningless’ dharna due to ‘stern warning’ of the high court and struggle of opposition leaders. 'Many congratulations to people of Delhi. Our struggle as well as stern warning from HC has borne fruit with CM @ArvindKejriwal ending his meaningless dharna & returning to work. Everyone except him was seen working in the Delhi Secretariat today, including AAP ministers,’ Gupta tweeted. Earlier in the day, the Indian Administrative Service officers said they were waiting for a formal communication from the Delhi CM for a meeting at the secretariat to end the impasse. The Supreme Court also refused an urgent hearing on a plea seeking its direction to declare as ‘unconstitutional’ the sit-in by Kejriwal and his cabinet colleagues. A vacation bench comprising justices S A Nazeer and Indu Malhotra said the plea for declaring the sit-in as ‘unconstitutional’ would be listed for hearing after the the top court's summer vacation. Lawyer Shashank Sudhi, appearing for petitioner Hari Nath Ram, asked for an urgent hearing of the plea, saying a constitutional crisis has been created due to ‘the unconstitutional and illegal’ protest by the CM. Earlier, AAP MLAs Somnath Bharti and A K Bagga, who were seeking an appointment to meet Baijal, were allegedly removed by the police from the L-G's office where they had gone to attend a Delhi Development Authority meeting. Both Bharti and Bagga, members of the DDA, after the meeting stayed back at the L-G's office and sought an appointment to meet Baijal.